We offer a choice of Superior Quality and range of Features and Power for every requirement. Economical model with a permanent filter plus (optional) replaceable sealed filter for easy waste disposal. Requires to be emptied only two or three times a year. Suitable for smaller homes, town houses, condominiums, rented homes. Due to the triple filtration this compact unit can be positioned inside a cupboard or in a confined area. No Bags to Buy… ever ! The STAR-VAC Vacuum System Power Units are designed for reliability. Time tested unit, using all metal motor with better heat dissipation and the unique motor shroud provides 360 degree peripheral ventilation creating optimum cooling to extend motor’s life and helps to reduce motor noise. The cyclonic dirt separation with a STAR-VAC Distinctive Permanent Self Cleaning inverted weighted filter provides better motor protection and performance, easy maintenance and superior filtration for a cleaner and healthier environment. The exceptional STAR-VAC filter does not attract dirt on the filter’s surface, due to it’s unique “Non-Stick” Teflon® Coated HEPA membrame filter. Moisture will not affect these attributes and it’s filtration properties. Based on laboratory and field tests, the STAR-VAC filter out perform other types of media, in terms of efficiency, air flow and resistance to biological growth. Take it with you when you move! Outside venting is not necessary! 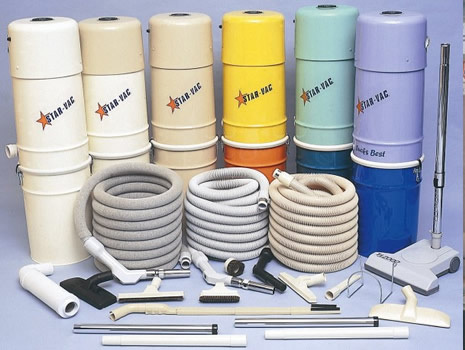 The true performance of All Vacuum Systems depends on Each Individual Power Unit, with the piping system installed… along with the hose and all attachment tools used ! Not the Motor Manufacturers Specification Only!